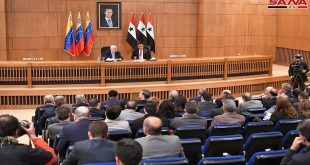 New York, SANA- Syria’s Permanent Representative to the UN Bashar al-Jaafari stressed that what the UN Security Council says about affirming Syria’s sovereignty and independence is being violated by a number of the Council’s member states. The shameful paradox lies in the contradiction in the response of those countries who have reached the stage of using the military force on the territories of other countries which are located thousands of miles away under the pretext of defending their national security in a time when they deny our right and duty in combating the same terrorism, al-Jaafari said. He added that the so-called “International collation” led by Washington had bombed a center of the deaf and dumb children in Raqqa and killed scores of them under the pretext of fighting the Islamic State in Iraq and Syria “ISIS”. AL-Jaafari tackled the contradiction in what one of the Security Council member states’ representatives said that his country supports the mission of the International Envoy to Syria Staffan de Mistura while at the same time he excluded the Syrian leadership from the political solution, in addition to violating the provisions of the UN Charter which prohibits the member states from interfering in other countries’ affairs. 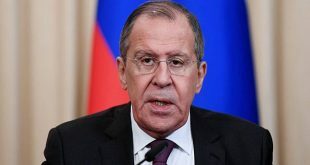 He added that ending the crisis in Syria will not be achieved as long as some parties don’t believe that the solution will come through the inter-Syrian dialogue through a Syrian leadership and without any foreign interference. “How can they pretend they are keen on improving the humanitarian situation in Syria while at the same time they impose illegal coercive measures on the Syrian people and how some countries prefer to support the “moderate” terrorism than to support the Humanitarian Assistance Response Plan in Syria whose funding rate hasn’t exceeded 16 percent for the year 2015,’ al-Jaafari wondered. 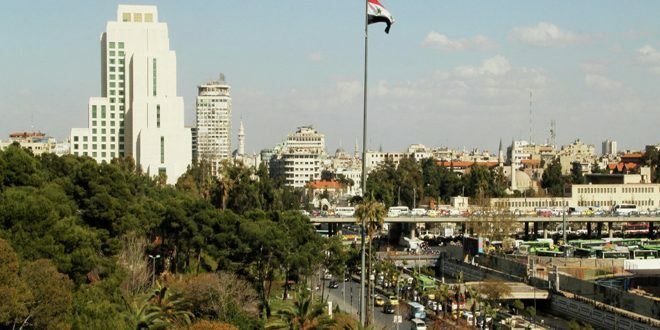 He added that the allegations of representatives of some countries that the Syrian government is besieging some areas and preventing the aid from entering them are naïve and misleading because those areas were secure and stable areas and there hadn’t been any humanitarian crisis in them until the entrance of the terrorist organizations to them which used the civilians as human shields and prevented the humanitarian aid from entering them. “How the Syrian government could besiege al-Yarmouk Camp while the ISIS was able to enter it assisted by Jabhat al-Nusra terrorist organization which already exists in the Camp…Is there anyone who can explain how the terrorist organizations and the arms still enter and get out of the areas which are called “besieged by the government” including al-Yarmouk Camp? Al-Jaafari also wondered. He indicated that the Syrian government has helped the residents of the Camp to safely get out of it after being stormed by terrorists, and provided the shelters and basic needs of life to the displaced, adding that there are only 1000 people in the Camp not 18000 as some allege. Al-Jaafari clarified that Syria has received millions of refugees from different neighboring countries and it has not exploited their ordeal in the political or financial blackmail or in justifying interference schemes. “The armed terrorist organizations entered the secure neighborhoods and forced the residents to leave their houses and to become displaced or refugees in camps previously prepared for them on the lands of the neighboring countries,” al-Jaafari said. He affirmed that the best way to help the displaced Syrians is to enable them to return to their homeland through solving the reason behind their displacement which entails a serious and real implementation of the Security Council’s resolutions relevant to countering terrorism. 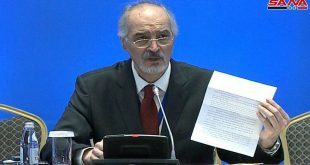 Al-Jaafari reiterated Syria’s adherence to its duties and responsibilities in alleviating the humanitarian burden on its people, and its readiness to take all the required national measures to achieve that, affirming that the cooperation with the UN is ongoing on condition that it adheres to the UN guidelines of providing humanitarian aid according to resolution no. 46/182 and on condition that the UN cooperates and coordinates with the Syrian government in different humanitarian issues. 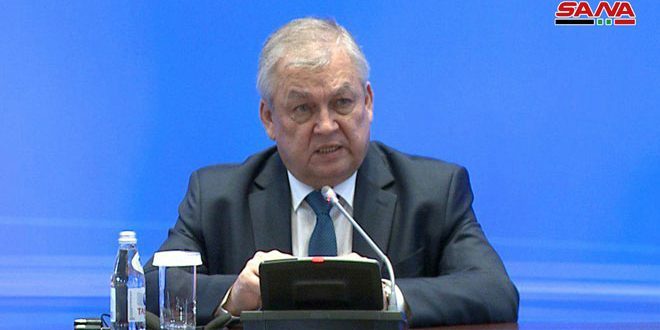 He indicated that the UN and other humanitarian organizations wouldn’t have succeeded in delivering the humanitarian aid to millions of the Syrians monthly without the cooperation and facilitations provided to it by the Syrian government. 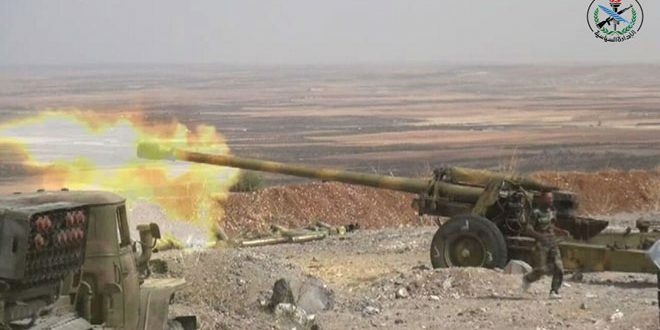 Al-Jaafari criticized the silence and “no comment” by the representatives of the delegations on the standing relation between Israel and Jabhat al-Nusra or the so-called “al-Yarmouk Brigade” in the disengagement zone in the occupied Syrian Golan and that there is no comment or criticism on the standing relation between Turkey and the terrorists. He also criticized the silence of the Security Council regarding Saudi Arabia’s impudent threat to Syria two days ago and about its violation of the UN Charter and its killing of civilians in Yemen. “It is nobody’s business, either Turkey or the others to talk about who governs Syria or about the choices of the Syrian people.. Nobody has the right to talk about the choices of the Turkish people or any other people of the member-states of this international organization,”, he went on to say. He asserted that the Turkish government built camps for the Syrian refugees before the start of the crisis just as it was happened in Kurdistan to the north of Iraq and it used the chemical weapon to accuse the Syrian army in order to urge the US President to launch a war on Syria and so the French did. Meanwhile, the UN Security Council reiterated in a statement during its session on the situation in the Middle East that there is no permanent solution to the crisis in Syria except through a comprehensive political process led by the Syrians themselves and meets the legitimate aspirations of the Syrian people with the aim of full implementation of Geneva Communiqué on June, 30th, 2012. The statement said that the humanitarian situation in Syria will be deteriorated in the absence of any political solution. The council voiced strong commitment to the sovereignty and territorial of Syria, supporting the mission of De Mistura in Syria. 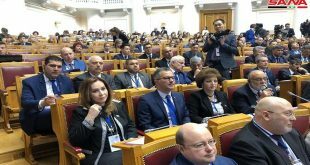 For his part, Russia’s Permanent Representative to UN Vitaly Churkin said that the only way to improve the living conditions of the Syrian people is eliminating the extremists there, adding that “terrorism is the danger and the main problem in Syria now “. “Moscow supports fighting ISIS and the other terrorist groups, Churkin said, asserting that hundreds of thousands of the people in the areas under the ISIS control cannot get humanitarian aid. Permanent Representative of Venezuela to the United Nations, Rafael Ramirez held the terrorist organizations, created by foreign sides in Syria, responsible for the humanitarian crisis in it. “Some countries violate the international laws through offering wide support to the terrorists to change a legitimate regime of a sovereign and independent country, Ramirez added. He denounced the role of some countries which offer havens and facilitate for the crossing of the terrorists into Syria. The ambassador affirmed the only solution to the crisis in Syria is through dialogue.